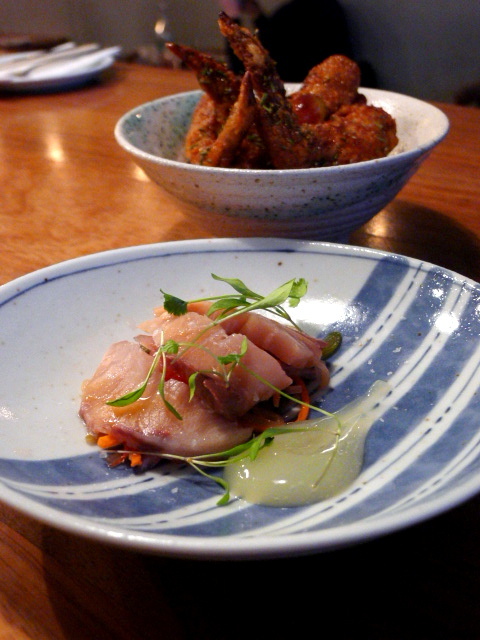 Found in the heart of Soho, Bo Drake is the brainchild of Jan Lee (a former chef de partie at Roka). 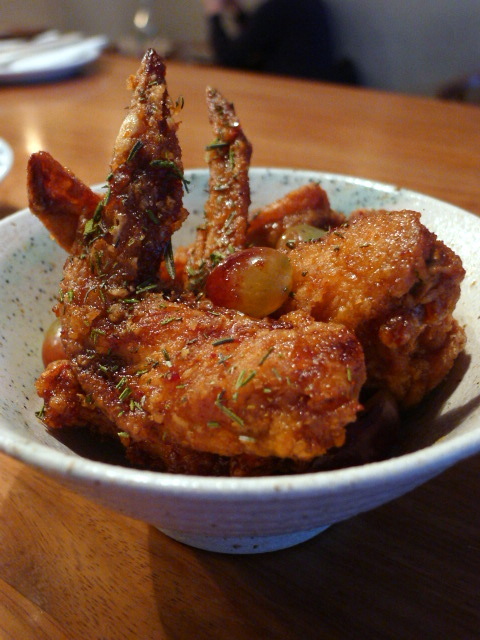 Bo Drake opened at the start of 2015 and is a modern East Asian restaurant with a Korean-style anju bar. It draws predominantly from Korean and Japanese inspirations with a bit of a European twist thrown in. The result is a contemporary experience that combines, for example, the sweet and pickled influences from Asia with slow-cooked BBQ methods of the West. The interior can be best described as a sleek casual hipster joint, with exposed bricks, pipes and tungsten lamps. The centrepiece is the bar fashioned from iroko with tall bar stools. Alongside it is simple wooden tables and there is a small dining area at the back. On the whole Bo Drake offered a fine eating experience. The dishes were well presented, nicely cooked and creatively constructed. The menu is essentially a sharing one, with la carte dishes priced at around £10. It was an enticing menu, covering a good choice of smalls, meat, fish, veg, bowls and sides. We began with some smalls. 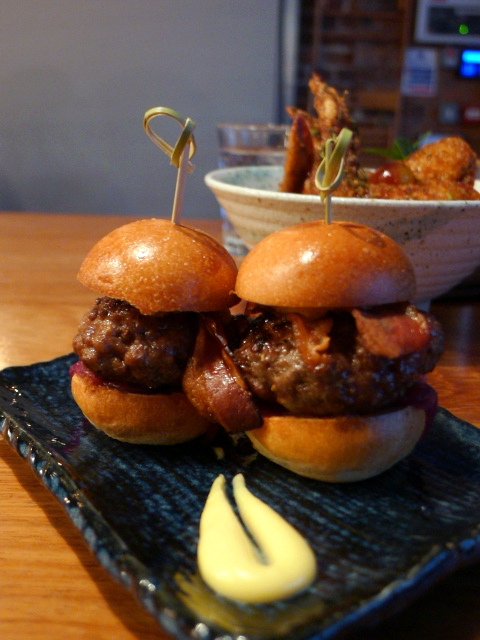 The first was the bugolgi beef sliders (2pc – £10.80) which were excellent and the star dish of the day. The minced beef was succulent and moist, and had been topped with some delicious caramelised red onions and crispy pancetta, all sitting in a warm and gently toasted brioche bun. It was well presented with some miso mayo on the side which was tasty. Korean food is famous for its Korean fried chicken (KFC). Here the Korean fried chicken wings (£9) had been shallow fried perfectly in a wok, resulting in a crispy finish and moist flesh. To dress the KFC were some fresh rosemary, a delicious soy garlic sauce, and some grapes to complete the sweet and sour effect. This dish was also excellent. Yellow tail sashimi (£8) consisted of three pieces of sliced yellowtail served on a bed of deliciously tangy and colourful homemade pickled vegetables. However we felt the dish was let down by the fish itself which lacked freshness. Next we chose from the ‘Bowls’ section. 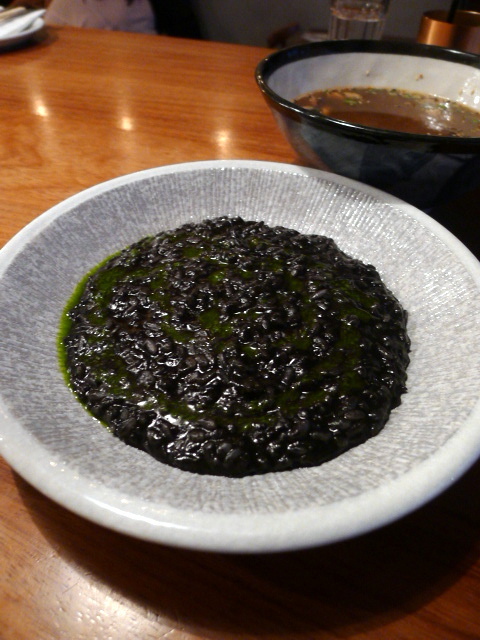 We dived into the black ink sushi rice risotto (£10.50), a stunning dish which delivered in taste and the texture, with finely chopped cuttlefish. The rice which could have been ever so slightly more al dente, but nonetheless this was an enjoyable dish with a lovely squid ink flavour. 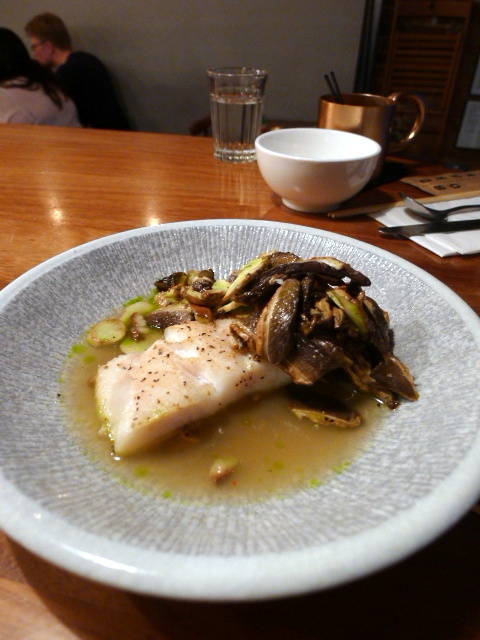 The first of our mains was a dish of roasted cod (£15) with porcini salad in a parsley oil dressing. The cod had been seared and then roasted in a stock. It was simple, precise food, but the dish was let down by the execution and the lack of freshness of the fish. 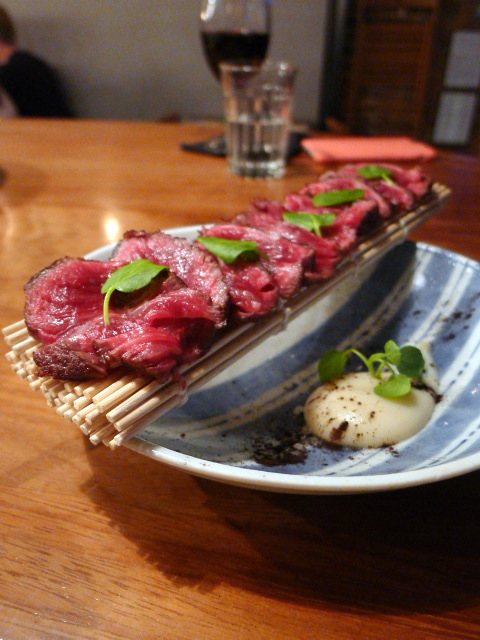 Wagyu ribeye tataki with celeriac gel (£36) was a well presented and good portioned dish, perfectly seared with just a touch of salt and pepper. It was tender, flavoursome and delicious, but we would have enjoyed it more with a touch more seasoning. We were advised that the celeriac gel was to cleanse the palette after the beef tataki, which was a nice touch. We chose three desserts and the highlight was the sesame soft serve (£4) which was made with Korean sesame oil and jersey cream, and finished with toasted sesame seeds. This was heavenly with the toasted seeds and the fragrance of the sesame oil taking the dessert to another level. It was delicious, and a pudding we would recommend to anyone eating at Bo Drake. 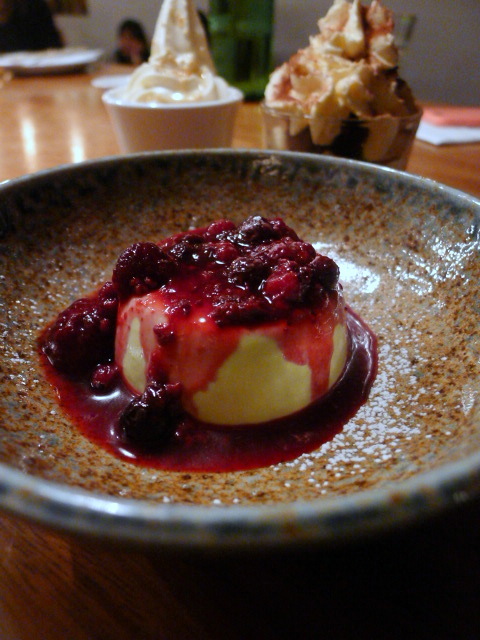 Next was the green tea pannacotta with berry compote (£7.50). The flavour of the green tea wasn’t bad, but the texture was a little on the dense side and there wasn’t enough of a creamy wobble. From the specials menu, we chose the sake tiramisu (£7) which was good in parts. There was a good flavour coming through from the cream, but the cake in the tiramisu was a little dry. The Korean-style anju bar at Bo Drake serves an interesting and diverse drinks menu. There was a good choice of Japanese sakes (hot and cold), Japanese and other classic whiskeys, new world wines, classic cocktails and fun cocktails such as the “Peas & Love” (£10) and “(Billy’s) White Wedding” (£10.50). We also found the service to be quite attentive. We dined during a late Sunday afternoon, so the restaurant wasn’t particularly busy. But it also provided a lovely opportunity for a good long chat. Bo Drake is bold in its approach which can be described as both playful and delightful, fusing Korean and Japanese touches and ingredients with Western influences. The menu was also good value, especially for a restaurant in Soho. Some of the dishes at Bo Drake were truly excellent including the bugolgi sliders, the KFC, the sushi rice risotto and the sesame soft serve. On the merits of these alone we would have rated Bo Drake a 4/5. But unfortunately the seafood dishes we tried dropped the experience down a notch. Prices: about £25 – £50 per head. Excludes drinks and service.